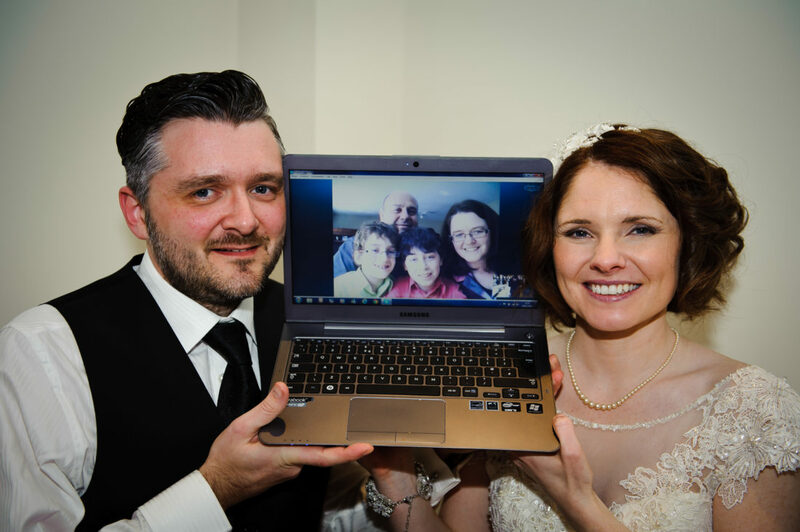 A couple whose family live in Canada and could not attend their wedding live-streamed the ceremony to them via the internet. Bridegroom Andy Oliver, 36, of Millhouses in Sheffield, was devastated that his Montreal-based sister could not fly over for his wedding to girlfriend Katie Lindsay, 37. So the couple invited Alison Gracioppo and her family to spend the day with them as ‘virtual guests’ and streamed the wedding via Skype. The family, who took the day off work and school to watch the wedding, even got dressed up for the day and watched the ceremony, the meal and the speeches. 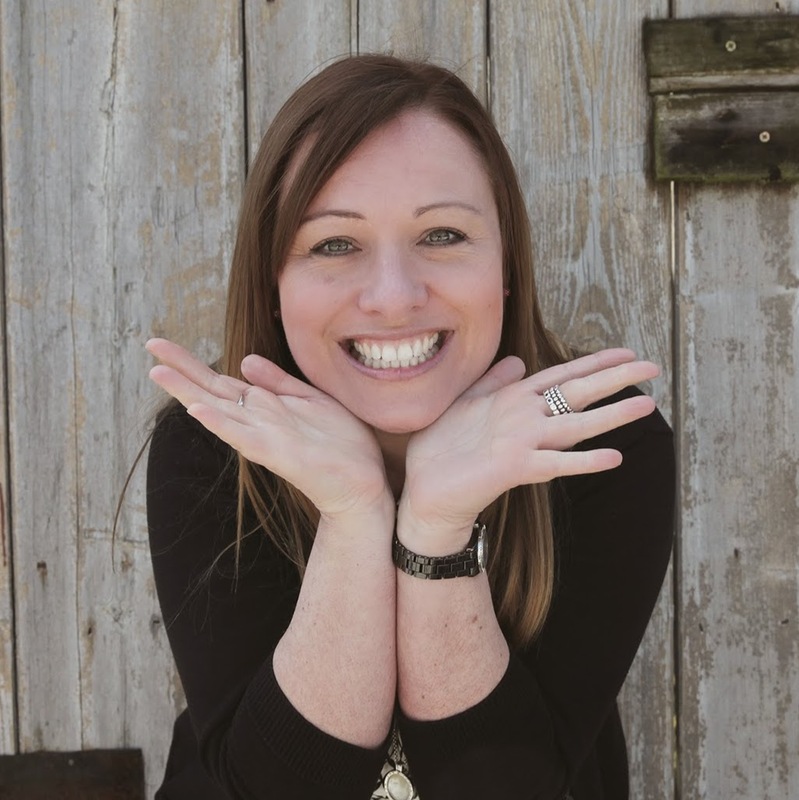 Katie said: “Alison moved to Canada some years ago with her job and she met her husband Steve over there and has since had two children. Andy’s other sister Claire got married last year and Alison completely missed out on that, so it was just fantastic that she was able to be involved with our big day. “They are four hours behind us and so the ceremony was at about 9.30am for them. But they all took the day off work and school so that they could spend the day with us. We positioned the laptop on a mantelpiece during the service so that they could see us saying our vows and hear all the readings. And then we had a chat with them afterwards during the drinks reception. Proposal: We went on holiday to Lapland to celebrate New Year because we wanted to go somewhere snowy and romantic. It was great because we went on a snow mobile, a sleigh pulled by reindeer and husky sledging. There was a big fireworks display on a ski slope on New Year’s Eve and Andy proposed there. He didn’t go down on one knee, he always says he would have disappeared down the ski slope if he’d done that. It was a total surprise, we had talked about I before but I wasn’t expecting it. He didn’t get me a ring because he said I am too particular, so we got one from Beaverbrooks when we got back. It is beautiful – it’s diamonds in a square setting in a platinum band. Date: After we got engaged we moved house and so we weren’t in too much of a rush to set the date as we had enough on our plates. 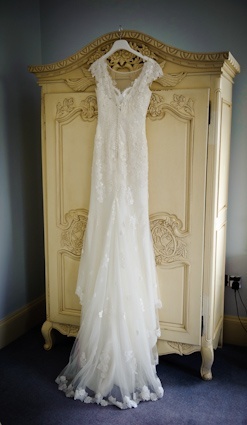 However, I knew the thing that would probably take the longest to organise was my dress. So when I had that in hand – and I knew it would take around 4 months to organise - we looked at venues and dates. 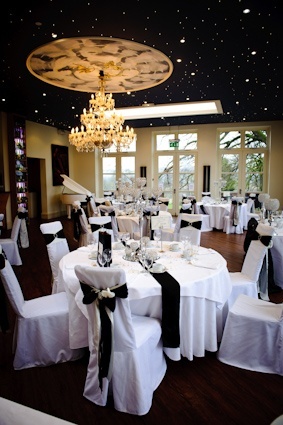 We didn’t mind a mid-week wedding and so booked March 20th, 2013. We both like winter and I wouldn’t have minded snow on the ground, so long as it didn’t stop people joining us. 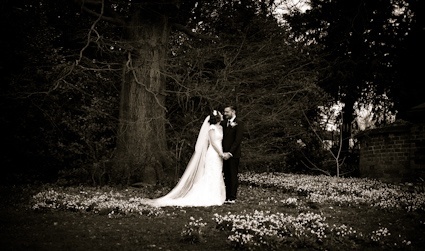 The snowdrops were out and the grounds still looked lovely. 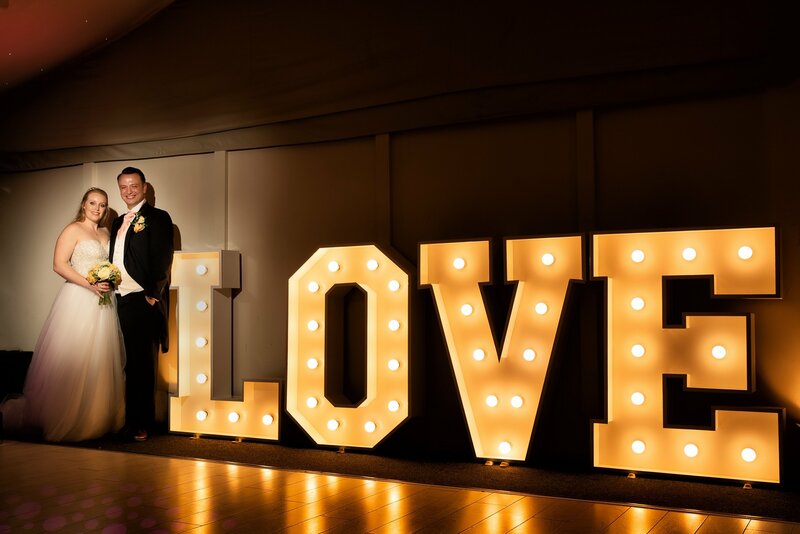 Shottle Hall: I’m from Sheffield and Andy is from Oldham and we have family all over the country, so we thought that a Derbyshire venue would be ideal. I found Shottle Hall on the internet and by coincidence, just before we were due to have a look around, I met some friends of friends who had held their wedding at Shottle. They had nothing but good things to say about it and as soon as we attended the Open Day we knew it was perfect for us. We didn’t even look around anywhere else. Dress: This was the very first thing I organised and I got it from Blissful Daze, in Sheffield. It was a Justin Alexander dress, a wedding designer known for vintage dresses. It was a warm ivory colour, quite fitted with a slight fishtail at the bottom. It was covered in sequins, pearls, and bugle beads and had a Sabrina neckline and cap sleeves. It also had a Venice lace overlay, a deep V-back and a chapel length train. I wanted a very 1920s/30s look as this is such a glamorous era and one that we both particularly love. The dress was exactly what I had in mind and I felt fabulous in it. 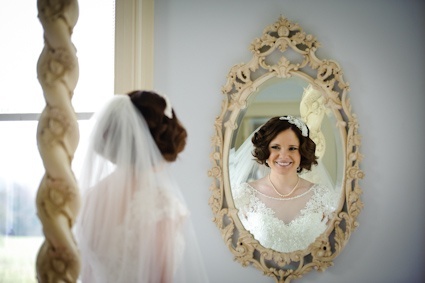 Hair and make-up: My mum, sister, niece and I all got ready at Shottle Hall and we had Claire Lowe from Ashbourne to do our hair and make-up. Claire got married at Shottle herself and she brought another lady with her to help out. I had my hair done in a marcel wave, which looked very 1920s to go with the theme. Bridemaids: My sister Jane Bendrey (34) was my bridesmaid along with her two daughters three-year-old Hannah and Alice who was 3 months. 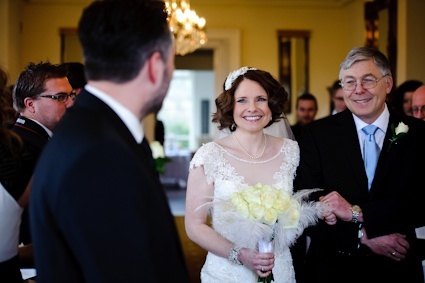 Jane’s dress, which was black and ivory, was Pearce II Fionda from Debenhams and Hannah’s was a Jenny Packham dress which was covered in sequins and beads. Alice wore a dress from Monsoon. Suits: Andy didn’t have a best man, but he wore a black three-piece suit from Hugo Boss. He also wore spats which added a nice 1920s touch. Flowers: We met Louise from The Greenery at one of Shottle’s Open Days. My hand-tied bouquet was made from ivory roses with little pearls in the centre of each one, with ivory feathers round the outside. My sister’s was very similar although she didn’t have the feathers. For one of the Open Days Louise had made a heart from roses which she hung on the front door, and I thought was stunning. 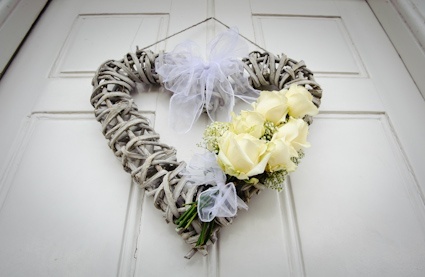 She said she could also do a wicker heart with some roses attached to it, which I would be able to keep after the wedding. It’s lovely because we have it hanging in our house now. Ceremony: We had 35 guests during the day and 70 at night. I’m half Scottish and so I walked down the aisle to bagpipe music – not an actual piper though, as that would probably be too much inside. My stepdad and Andy’s dad both did readings, one was a Red Red Rose by Robert Burns and the other was The Flowers, which is about a man who didn’t buy his wife flowers in case she didn’t like them. It made a few people laugh, because Andy never buys me flowers. I did think I might cry, but had a moment outside the room and managed to hold it together. I didn’t want to ruin my make-up. Andy’s sister was a witness and my best friend Emily, who I have known since I was five, was too. After the ceremony we went off and had lots of photographs taken, and our guests enjoyed drinks and canapés. They had things like strawberries dipped in chocolate, hummus and vegetable dips, tortilla chips – I’m told they were lovely but we never got round to having any. Reception: We had afternoon tea in The Orangery. I didn’t really want a great big meal, I like to pick at food and I don’t like the way that you often end up eating a great big meal at a funny time of the day at weddings. So we had a selection of sandwiches; brie and onion tarts, Bakewell tarts, and cream scones which were all absolutely delicious. We had sparkling wine for the toasts, but otherwise served tea and coffee. Because it was a mid-week wedding a lot of our guests were driving. Andy and I sat at a sweetheart table for two – my parents are divorced and without a best man we didn’t want a traditional top table. Andy and my dad both did speeches – nothing too humiliating fortunately. Tables: Both Andy and I are into motor racing and so we named all the tables after race tracks we have been to. Our table was called Oliver’s Mount after the bike track and also because Andy’s surname is Oliver! We made the table plan and the names for each table which were done in a very vintage font with scrolls, and the outline of each racetrack too. Jo, from Cakey Wakey, helped us with the table decorations and chair covers. 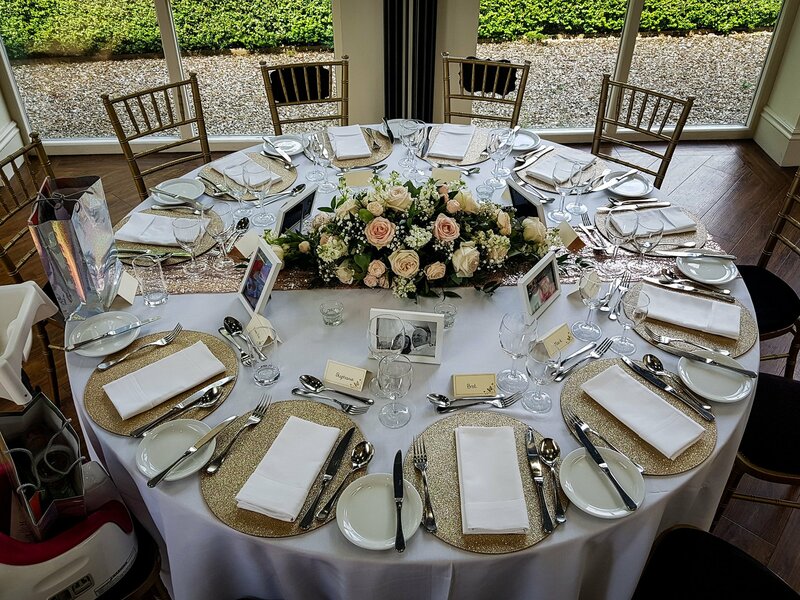 I continued the black and ivory theme – black sashes on the chairs with a broach pinned on the back and we had black satin bands across each table. Jo scattered black and pearlised crystals on the tables and we had candelabras that held little tea lights on every table. Instead of favours we had two big jars of sweets and chocolates for people to help themselves to – we thought there would be loads left and that we’d be able to scoff them on our honeymoon, but they had nearly all gone! Evening: We had Spirits High, we felt it made sense to use people who are familiar with Shottle Hall wherever possible and he was perfect. Our first dance was to Rule the World by Take That, which Andy picked as I am always dragging him to concerts to see them. We had planned a few moves in advance but nothing too outrageous! Cake: I made our wedding cake – if I wasn’t in construction then I would love to be a cake maker. I make everyone’s birthday cakes and I had made one wedding cake before for a friend. Everyone told me it would be too stressful making my own cake, but actually I enjoyed it and Andy helped me. It was three tiers, milk chocolate, white chocolate and milk chocolate again on the top. I decorated it with chocolate sticks around the sides and chocolate shavings on the top – it was quite plain I suppose, but I was very pleased with it. 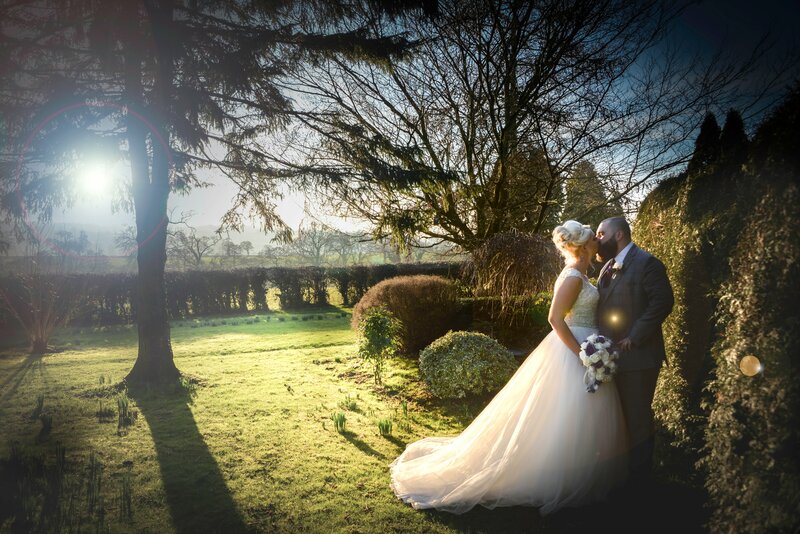 Photographer: We had Jon from Newton Photography who we would definitely recommend. 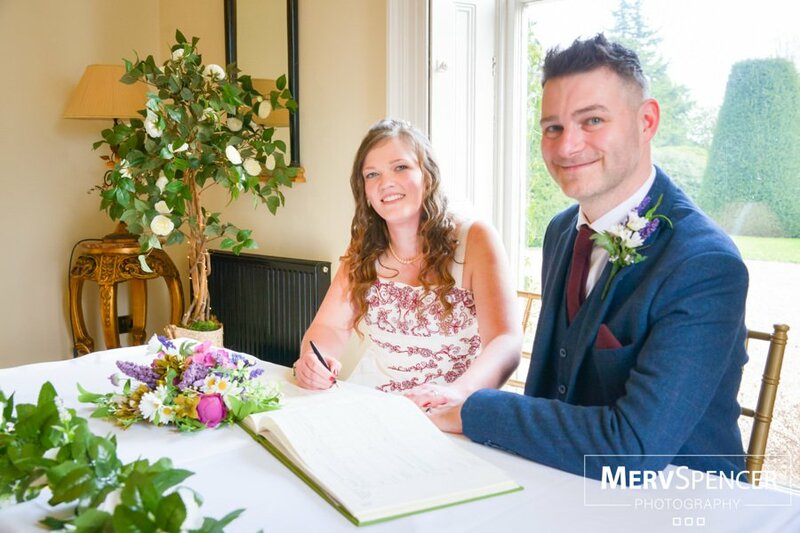 We are absolutely thrilled with the pictures and everyone who has seen them has commented on the quality of them and also how lovely he was on the day. Jon suggested we took someone with us to make us smile while we were doing our portraits and so my brother-in-law came with us – and on some of the pictures you can tell we are really laughing. Our favourite photo is one of us walking through the confetti with the guests in the background – it’s just really natural and happy. 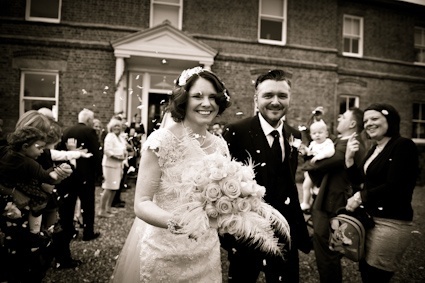 Memorable moment: My favourite moment was when I turned round and saw Andy waiting for me at the bottom of the aisle. We don’t like being apart and I had left him at 4pm the day before, so I was just really pleased to see him. It was also the start of everything we had been working towards and it was great to see how everything was coming together. Honeymoon: We drove to Scotland and toured around visiting places like Aviemore, John O’ Groats, Gairloch and Loch Ness. We love Scotland and try to visit every year on holiday and because we had a bit of extra time we went all the way to the top of the country. There was snow on the top of the mountains and we did lots of walking – it was wonderful. We actually had better weather up there than down here too, it was clear and dry everyday.